I haven’t been around in a while and for that I blame everyone but myself. In all honesty, I do feel like there were a few things against me over the summer that led to my pretty severe absence. My phone fell on concrete and shattered and I had to go one step above old school phones(I did all my blogging on my phone…just fyi) and our computer suddenly hooked up to our T.V by some unknown force (hubby) and our only real functional, quick fix for my blogging was my husbands work laptop that is never around. So there have been some unforeseen things that made my blogging a little harder to complete… and then there was just my laziness. You wonder how I am back… well I now have my hubby’s “old” work laptop because he upgraded, I really have no complaints about that! So what have we been doing for the last 3 plus months? We have been knee deep in our first year of homeschool, our first year of c0-0p and my first year of the busiest I’ve ever been. That last sentence might seem a little over-the-top but really, I mean every word. I’ve been planning, and praying and worrying over homeschooling for the last 2 years and now that it’s here I really don’t have much time to do any of those things except pray but even then it’s a lot less than before. I think that’s only because I really do feel, in my gut, that homeschooling is for us. The last two years I spent praying about it and wondering if I could cut it and while I don’t really know if I can cut it, I think for the most part our family is rocking the first year. Don’t get me wrong, I struggle to find things for my youngers to do when I’m doing things with my kindergartener that they just can’t do. Our littlest likes attention a lot. (There is really nothing more I can add to that.) For the most part though, we have fallen into a groove and while I know it’s right for us I also know that it is stinking hard and hectic and sometimes insane but I really wouldn’t change it for anything. So I have missed all the blogs that I have followed and the bloggers that follow me. Sadly I haven’t been able to or made time to get on and take a gander. My title of this post really is as true as it can be. I feel like I’ve just been sitting on the sidelines the last few months, I’ve been itching to get back into writing and just the blogging community in general! Can’t wait to see what ya’ll have been up to!! Here’s to getting off that bench!! There is no one I’d rather be than me. Last day of the 3 Day Quote Challenge, I had to throw in one from one of my kiddo’s favorite movies. And the fact that it is spot on totally helps. I had a more serious quote picked out when I first started putting this together (which you can see at the end of this post) but just couldn’t seem to get the wisdom of Ralph out of my head. I do believe the quotes could be some what related with a little reaching. Anyways something my kids and I talk about quite a lot is being happy with ourselves. Not wanting what someone else has and being content with what we have. Basically a “get what you get and don’t throw a fit” mentality but I feel like we try to go beyond that a little. 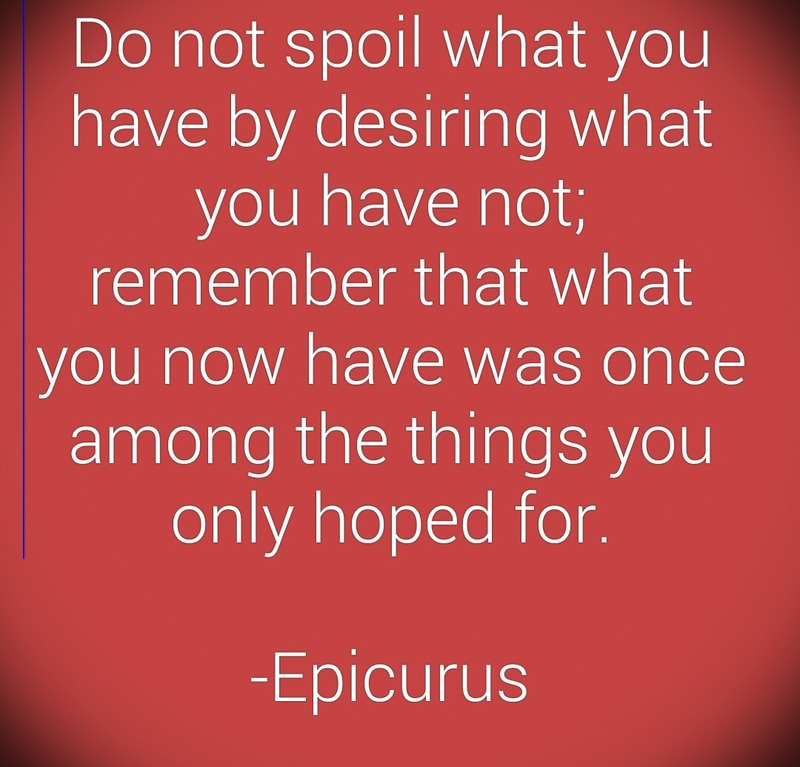 We not only try to not throw a fit when we don’t have what we want or we don’t like something but we try to find happiness and appreciation in the things that may not be exactly what we’d hoped for. 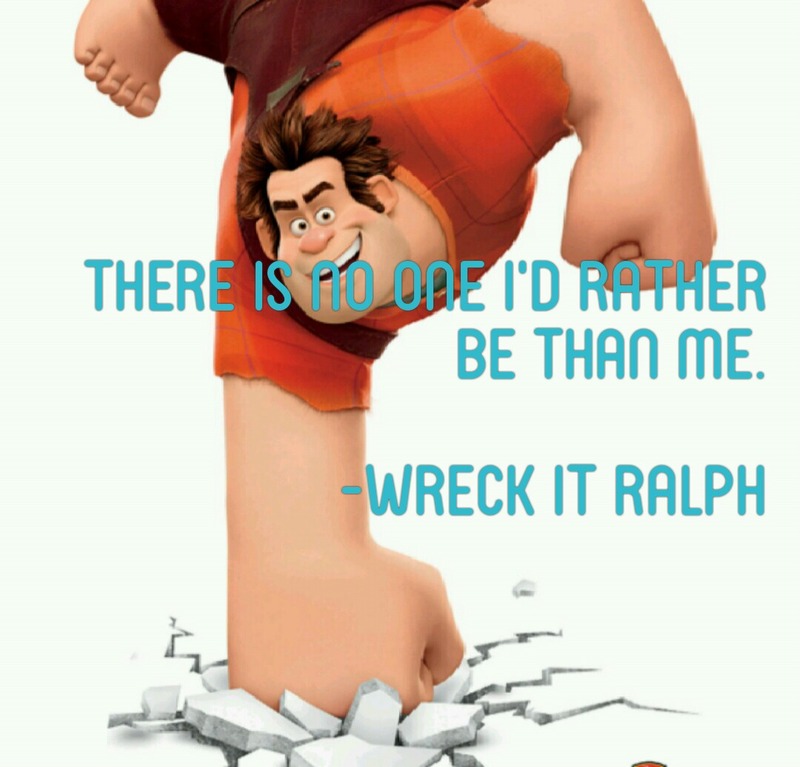 So here’s a little inspiration for today from a very insightful kids movie!! These are my last 3 nominees for this challenge. Just post a favorite quote for 3 consecutive days and nominate 3 bloggers to do the same. The last two weeks I’ve been stuck in my head a bit. I have not made time to write or blog and I’m starting to feel the affects of my neglect. The last two weeks have been extremely busy so it’s not like I’ve just been sitting around doing nothing but regardless I have missed this lovely, stress free blog of mine and of course all the lovely readers and writers that I enjoy so much. (I’m talking about you!) So what have the last couple weeks looked like. Here I am back with an urgent need to write and get back to “normal”. Here’s a little picture of part of my bathroom. My favorite part so far but I haven’t begun to decorate yet so my favorite could possibly change in the near future. 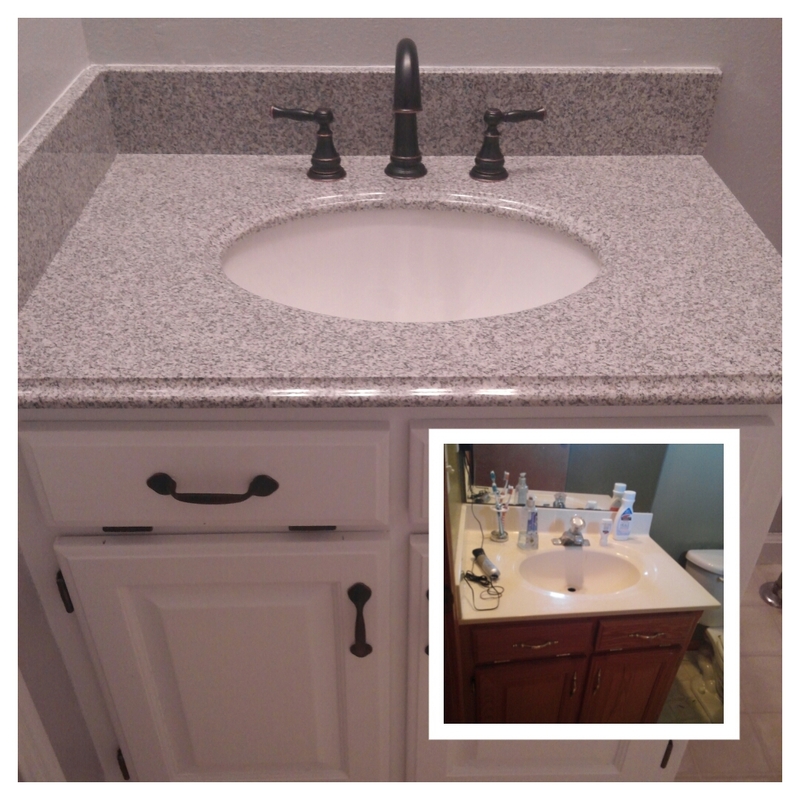 As you can see, my old vanity was a sad honey oak little drab but with some paint, new handles, new vanity top and faucet, it is a breath of fresh air and I can’t wait to start using it. My bathroom is so much lighter and brighter, simple and sweet and well… it just makes me smile. I have several ideas for some reclaimed barn wood that my parents have that I hope to have turned into a pretty groovy hanger/shelf for our towels. I’m sure I will blog about it. So I’m a little behind with getting this posted but better late than never. I was nominated for the Blogger Recognition Award. I was nominated by the wonderful blogger and writer over at Seekingyoufirst thank you so much for the nomination, you are an inspiration! Here are the bloggers I am nominating. I wanted to nominate blogs that I have just recently started following but the real reason I am nominating you is because I enjoy following you on your blogging/writing journey. 🙂 You are all inspirational, educational and most of all entertaining! :) Thanks for being awesome! You totally do not have to do this but if you would like to participate the rules are below. 1. I am 5’10 and always slouching when I’m around shorter people which is a lot of the time. Trying to stop doing that! 2. I love love love popcorn, could eat it every night if I could. Usually run out of butter or kernels and those are sad nights. 3. I’ve been married for almost 7 years and have 3 children 4 and under. 5. Trying to make this the year of making over our house. Haven’t gotten very far yet. 6. I do not like tea of any kind, nope nope nope. Coffee and water baby! 7. I’m homeschooling my 3 kids at least through the elementary years. Here are the 11 random facts about me and the 11 questions I was asked. 1. I have a thing for coffee. I fall asleep thinking about the cup of coffee I’m going to have in the morning. Sometimes I can’t sleep because I’m so excited about it. 2. I make lists for everything and if I don’t complete it or if I think it’s not “just right” I make it again. It’s my one OCD quality. 3. My husband says that I’m messy and he prefers a clean house more than I do. 4. I have written a book and hope to publish one day. I probably need to focus more on that. 5. I’m not a complainer, don’t care for it and just try to stay positive. 6. I used to want to be a baker but then got busy. 7. I used to have major crushes on David Duchovny and Harrison Ford when I was in middle school. Still have folders of facts and pictures of them in my attic somewhere. 9. I am a huge daddy’s girl. HUGE! But all my sisters are too. He’s definitely someone to love! 10. I absolutely love coffee. 11. I’m 30, gotta start working on my bucket list. 1. What was your favorite toy as a child? I had a baby doll that had curly hair and would say I love you when i pressed her wrist. 2. If you could do ANYTHING today, what would you do? I would love to fit in my pre-baby baby baby jeans. I’m slowly on that path but would love to be there already! 3. What are you listening to? Right now- my baby crying it out in his crib:/. In the CD player – Good Morning Baby in Spanish. But I wish I was listening to Switchfoot. 4. Who is your favorite fictional character and do you have a reason or just because? I’ve got mommy brain right now, I know I have one or several but could take days to think of so I will move on. 5. What is your favorite holiday and why? Christmas, I love the spirit of it. i love the reason for it and I love the food that’s involved. 7. Who’s your favorite James Bond? The most recent I think. It’s the only one I’ve really watched. 8. Do you have a favorite game and what is it? I love Aggravation. Grew up playing that with my family, still play when we all get together. 9.What is you least favorite word or the word that makes you cringe? Don’t have one. 11. Who is your favorite Youtuber or do you have one? Nope, no time for Youtube. Here are your 11 new questions. 1. If you could travel anywhere, where would it be? 3. If you could buy anything no matter the cost, what would you buy? 5. Outside or inside person? 6. What is something you would love to learn to do? 7. If you could change one thing about your life what would it be?